Catherine Richardson, Tara Hamling, David Gaimster, "The Routledge Handbook of Material Culture in Early Modern Europe"
The Routledge Handbook of Material Culture in Early Modern Europe marks the arrival of early modern material culture studies as a vibrant, fully-established field of multi-disciplinary research. 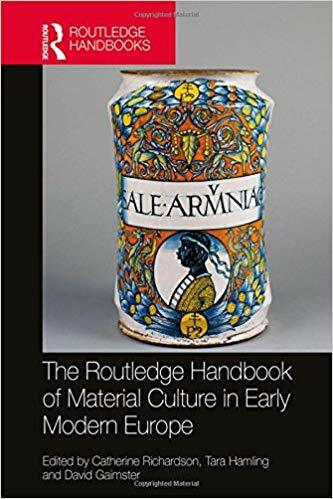 The volume provides a rounded, accessible collection of work on the nature and significance of materiality in early modern Europe - a term that embraces a vast range of objects as well as addressing a wide variety of human interactions with their physical environments. This stimulating view of materiality is distinctive in asking questions about the whole material world as a context for lived experience, and the book considers material interactions at all social levels. There are 27 chapters by leading experts as well as 13 feature object studies to highlight specific items that have survived from this period (defined broadly as c.1500-c.1800). These contributions explore the things people acquired, owned, treasured, displayed and discarded, the spaces in which people used and thought about things, the social relationships which cluster around goods - between producers, vendors and consumers of various kinds - and the way knowledge travels around those circuits of connection. The content also engages with wider issues such as the relationship between public and private life, the changing connections between the sacred and the profane, or the effects of gender and social status upon lived experience. Constructed as an accessible, wide-ranging guide to research practice, the book describes and represents the methods which have been developed within various disciplines for analysing pre-modern material culture. It comprises four sections which open up the approaches of various disciplines to non-specialists: 'Definitions, disciplines, new directions', 'Contexts and categories', 'Object studies' and 'Material culture in action'. This volume addresses the need for sustained, coherent comment on the state, breadth and potential of this lively new field, including the work of historians, art historians, museum curators, archaeologists, social scientists and literary scholars. It consolidates and communicates recent developments and considers how we might take forward a multi-disciplinary research agenda for the study of material culture in periods before the mass production of goods.